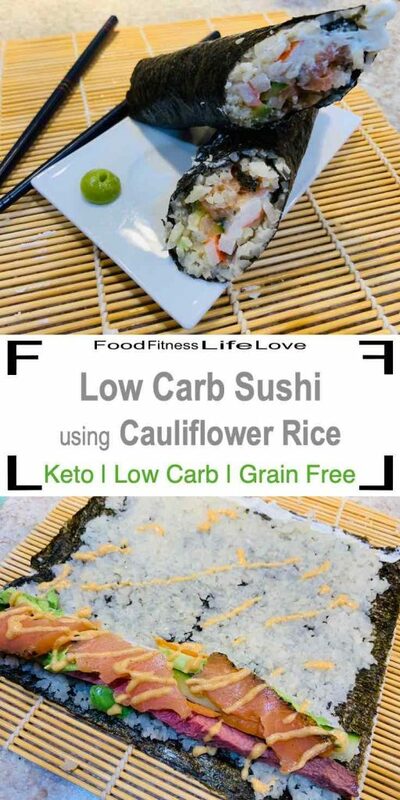 This lightly seasoned Cauliflower Sushi Rice is the perfect base to make Low Carb Sushi at home; no need to miss out on one of your favorite meals. It’s one of those special meals for my husband and me. Rice is the one thing about sushi that doesn’t fit our low-carb lifestyle. My husband has been asking me to try to make Cauliflower Sushi Rice for quite awhile, and we finally did it. The flavor is excellent and you won’t miss the rice. One of the restaurants we loved getting sushi at in Seattle made a roll called “The Duke,” which included steak instead of raw fish. We love raw fish, but we usually make our version of “The Duke” at home. 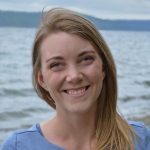 It’s a great introduction to sushi for the kids, who aren’t sure about eating raw fish. It was also a life saver when I was pregnant and craving sushi. Some of the other ingredients we used were: carrots, avocado, cucumber, cream cheese, imitation crab, and smoked salmon. And, of course, the seaweed sheets called Nori. The great thing about sushi is there are so many filling options, so grab your favorites and get creative. Making the Cauliflower Sushi Rice was a family experiment, so we learned a few things. Most importantly, the cauliflower rice is not as sticky as regular rice. The stickiness of the rice is important for keeping the roll together. We overcame this lack of stickiness in a couple ways. One: the rice stayed on the inside of the roll. Two: we spread a little cream cheese on the edge of our nori to act as glue when rolling up the the sushi (you can see it in the picture above.) And three: we found that hand rolls worked better than slices. Here’s a great video showing you how to roll sushi if you’ve never done it before. 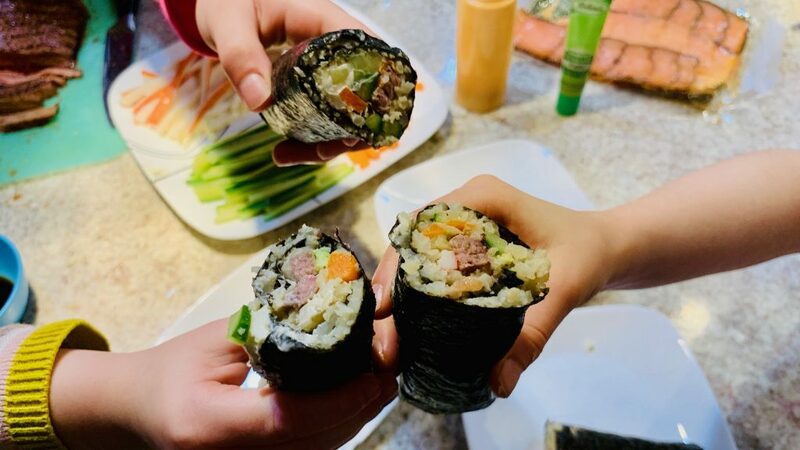 Our Low Carb Sushi turned out delicious, and the hand rolls were actually easier for the kids to hold and eat (way better than trying to use chopsticks with sliced sushi). 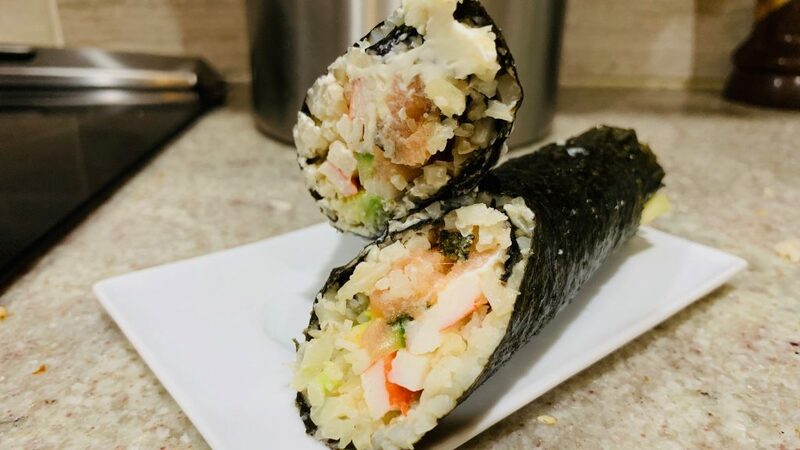 This lightly seasoned Cauliflower Sushi Rice is the perfect base to make low-carb sushi at home; no need to miss out on one of your favorite meals. 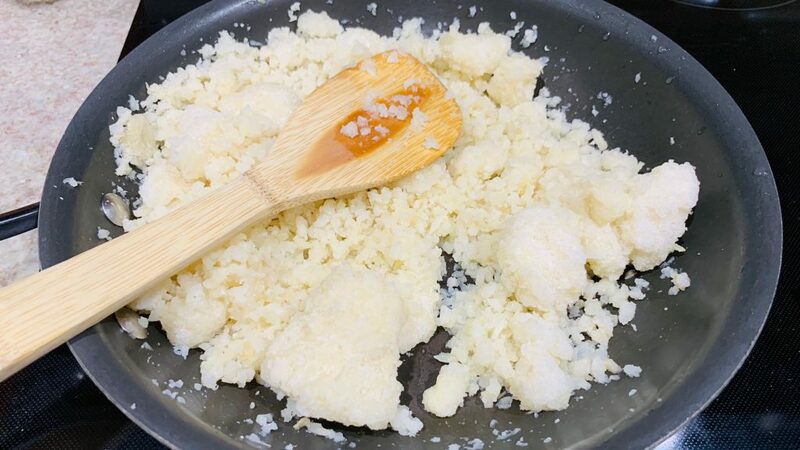 Cook the riced cauliflower in a skillet until cooked through, about 5-7 minutes. Add cooked cauliflower rice to a bowl with remaining ingredients. Stir continuously until the the seasoning is fully incorporated and the cauliflower rice is cooled to room temperature, about 10-15 min. While the cauliflower rice is cooling, gather your remaining ingredients. 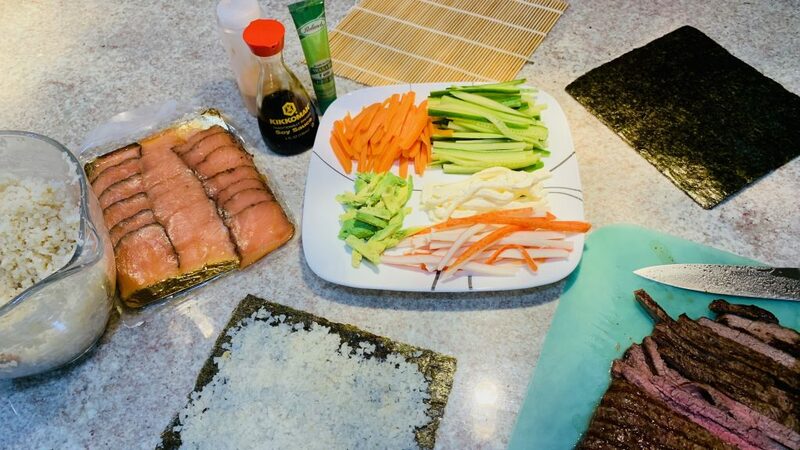 To make a sushi roll, lay out a sheet of nori on a bamboo sushi rolling mat. 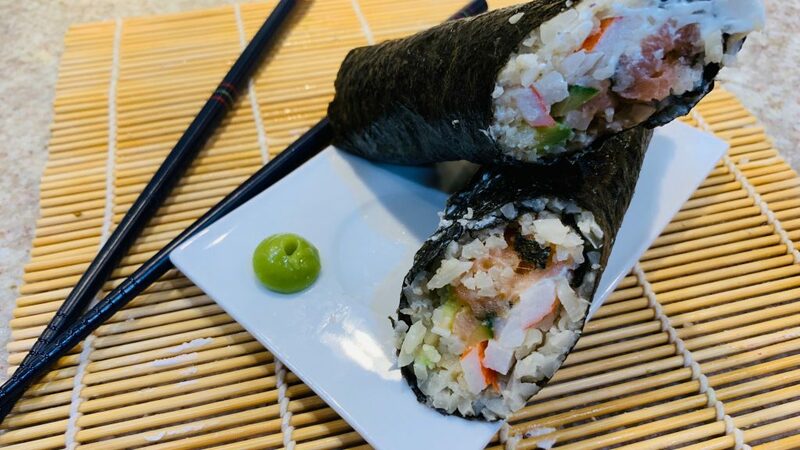 Press the cauliflower sushi rice onto the seaweed sheet in an even layer. 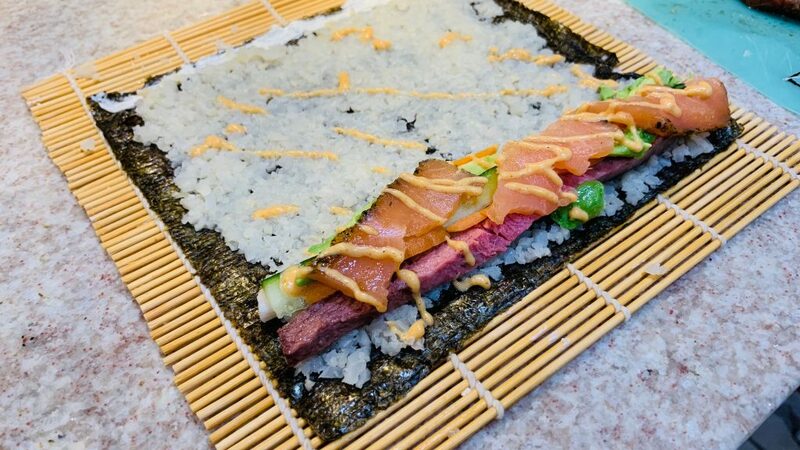 Layer your filling ingredients on one end of the rice covered nori sheet. On the opposite end, speed a thin layer of cream cheese directly on the nori. Using the bamboo rolling mat, roll up your sushi starting on the filling side, making the roll as tight as possible. Continue until it is all rolled up and press the cream cheese edge to the seaweed to help hold it all together. Cut your roll in half to make hand rolls. Serve with soy sauce and wasabi as desired. Enjoy.